via The Internet of Things is About to Solve Biotech’s Oldest Problem in The Internet of Things (IoT) curated by RafidisGraffiti. Investors are going crazy for everything and anything associated with the Internet of Things, or machine-to-machine communication. After all, the field has the potential to add significant efficiency gains throughout the global economy in applications ranging from household appliances to agriculture to industrial manufacturing. While it is rarely discussed, the Internet of Things also has the potential to revolutionize biotechnology laboratories and research and development efforts — perhaps creating substantially more value for biotech than in any other headline-grabbing applications. The leaders in automated biotech lab services might not be household names today, but they’re racing to build next-generation biofabrication facilities that will be difficult, if not impossible (or, at the very least, very expensive) to compete with. In other words, the early movers could be the only players in the market for quite some time, which could force future biotech companies to adopt business models strikingly different from those observed today. What makes the Internet of Things incredibly important for biotech? What, exactly, does automated and interconnected biotech research look like? And what does it mean for companies such as Intrexon and Amyris ? Let’s look at how automation and the Internet of Things are upending decades-old standards in the biotech industry. One big problem: humans make mistakes. They write down the wrong parameter (or forget altogether), add the wrong liquid to the wrong test tube, and mislabel samples. Even when an experiment is performed perfectly, two labs can produce very different results. Reproducibility is biotech’s oldest problem. That’s pathetic — and costly. It is cited as a leading reason for high drug failure rates in healthcare applications of biotech and has decimated early industrial biotech companies such as Amyris that attempted to scale chemical production from 2-liter bioreactors to their 200,000-liter commercial scale counterparts. It highlights the finicky nature of biology (in our current limited understanding) and that humans simply aren’t the best way to conduct biotech research. Robots and software, on the other hand, always log the correct parameters, never add the wrong volume or liquid to a test tube, and don’t mislabel samples. (Unless, of course, a human programs them incorrectly.) Only once biotech research is truly reproducible can we quickly commercialize new inventions and pinpoint errors in the R&D process. How is the Internet of Things coming to the rescue? The company leverages its R&D expertise to build new organisms capable of manufacturing the cultured ingredients its customers desire, thereby monetizing the R&D process through contracts, and collects royalties if the ingredients are successfully commercialized. Customers save money by avoiding the need to conduct in-house research and gain a competitive advantage through a more effective or lower cost ingredient. Ginkgo Bioworks gets paid to compound its understanding of biology and widen the gap between internal and external capabilities, perhaps one day making it absurd for products companies to build their own organisms. After all, technology companies today don’t produce their own silicon chips. We can thankIntel for that. Similar versions of that business model are employed by other organism companies. Intrexon ended 2014 boasting 17 exclusive channel collaborations, or ECCs, that leverage the company’s technology platform and automated R&D labs. While its future is heavily dependent on healthcare applications, CEO R.J. Kirk expects to generate $100 million in revenue from engineered cow embryos and other bovine reproductive tools and services in 2015. Those early troubles weren’t fun for shareholders, but eventually led to the departure of several key employees who would go on to start their own companies taking aim at biotech’s reproducibility problem. Zymergen has quickly ascended the ranks as a leading organism company, while software start-up Riffyn aims to make biotech R&D truly reproducible through data collection, talking machines, and data analysis. In addition to organism companies, several computer-aided manufacturing, or bioCAM, companies have built automated R&D platforms accessible through the cloud. Researchers residing anywhere with an Internet connection — be it an academic lab, a major pharmaceutical company, or a local coffee shop — can submit experiments virtually to Emerald Cloud Lab or Transcriptic, have armies of robots execute the experiment, and send an email when the results are ready for download. It’s cheaper, the results are reproducible, and researchers can spend more time doing actual science. 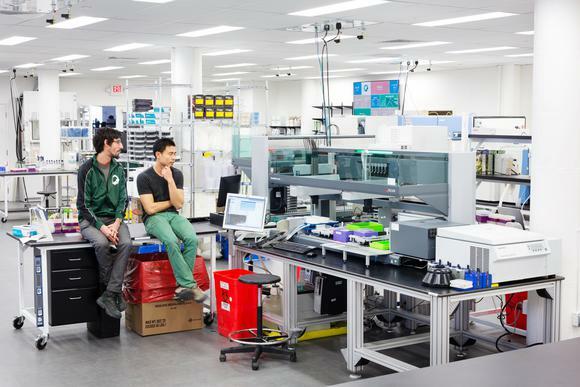 While making biotech R&D more reproducible and predictable is great for corporations and academic institutions, automated platforms also put world-class infrastructure into the hands of the masses. We’re nearing the point where anyone with a little biology knowledge, a laptop, and an Internet connection can create a custom organism or biology-derived product from a coffee shop. In fact, it’s already possible today — engineered houseplants included. While many companies building and leveraging biotech’s new, automated infrastructure are still accessing private capital, the bio-Internet of Things is already beginning to trickle down to publicly traded companies through cost savings. Sooner than later, individual investors will have no shortage of investment opportunities to choose from. Unfortunately, for now, more patience is required, but the future looks bright. One bleeding-edge technology is about to put the World Wide Web to bed. And if you act quickly, you could be among the savvy investors who enjoy the profits from this stunning change. Experts are calling it the single largest business opportunity in the history of capitalism… The Economist is calling it “transformative”… But you’ll probably just call it “how I made my millions.” Don’t be too late to the party — click here for one stock to own when the Web goes dark. The article The Internet of Things is About to Solve Biotech’s Oldest Problemoriginally appeared on Fool.com. Maxx Chatsko owns shares of Amyris. Check out his personal portfolio, CAPS page, previous writing for The Motley Fool, and follow him on Twitter to keep up with developments in the synthetic biology field.The Motley Fool recommends Intel. Try any of our Foolish newsletter services free for 30 days. We Fools may not all hold the same opinions, but we all believe that considering a diverse range of insights makes us better investors. The Motley Fool has a disclosure policy.Copyright © 1995 – 2015 The Motley Fool, LLC. All rights reserved. The Motley Fool has a disclosure policy.